For Republicans who think there is a lack of strong candidate choices, be thankful for Mitt, Newt, and even Rick & Rick. To feel better, just take a look at Russia. 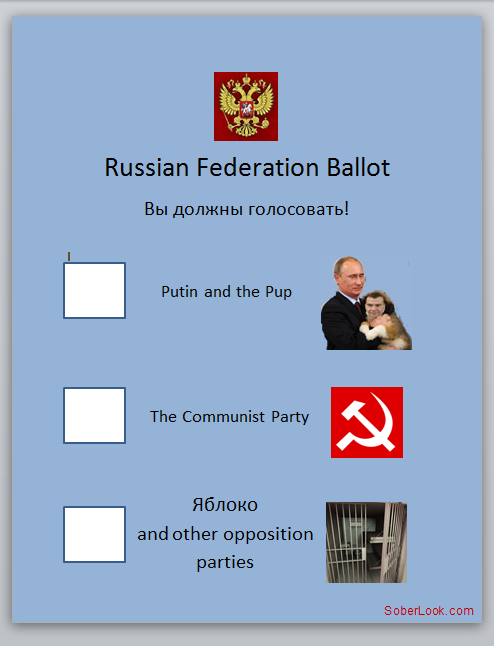 The good news is United Russia (Putin's party) has some real opposition for a change. The bad news is the largest opposition is the Russian Communist Party. Businessweek: Putin’s United Russia won 49.5 percent of yesterday’s vote for the State Duma, down from 64.3 percent in 2007, the Central Election Commission said, citing a preliminary tally. The results give United Russia 238 seats, or 52.9 percent of the 450-member legislative body. The Communists polled second with 19.2 percent, up from 11.6 percent four years ago, boosting the number of their seats to 92 from 57. Turnout was 60.2 percent. As was the case during the Soviet era, any real opposition to the ruling elite is suppressed through persecution. Khodorkovsky, who has been a leading financier of Russian opposition parties is a great example of that. He is in prison for 14 years. The NYT: The major reason for his persecution, Mr. Khodorkovsky asserts, was his support of the political opposition after promising Mr. Putin that he would stay out of politics. Bring this to the upcoming Primary for some compare and contrast.